Before the discovery of insulin in 1922, diabetes mellitus was often a fatal disease. High blood sugar levels and sugar in the urine were recognized as symptoms, and scientists knew by the early 20th century that a substance from the pancreas could lower sugar levels. Frederick M. Allen (1879-1964) was the first to realize, however, that diabetes was more than a problem with blood glucose; rather, it was a global disorder of metabolism. Allen developed the best therapy for diabetes available before insulin, a restricted-calorie diet that provided mainly fat and protein, with the minimum amount of carbohydrates needed to sustain life. 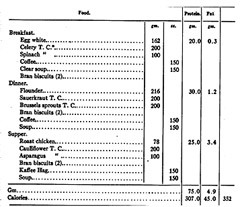 Between 1914 and 1918 he treated 100 diabetics at the Rockefeller Hospital with this diet. Many other physicians began prescribing it, including Elliott Joslin, the most prominent American specialist in diabetes. Allen based his diet on experiments with hundreds of dogs, cats, and other animals in which diabetes had been induced by removing most, but not all, of the pancreas. For about three decades scientists had known that completely removing the pancreas from a dog creates severe and sudden symptoms of diabetes. Allen's technique produced a milder, chronic diabetes, more like the disease in humans. Then he painstakingly controlled food intake and measured glucose in the urine to investigate how the diabetic animals metabolized fat, protein, and carbohydrate. The results of his work, published in 1913, came to the attention of the newly founded Rockefeller Institute. Metabolic diseases were a focus of research at the Rockefeller Hospital, which had opened in 1910, and Allen was recruited to extend his research to studies with patients. Allen's diet was far from a cure. It essentially brought people with severe diabetes to the brink of starvation in order to control the disease. Yet many diabetics sought his treatment, and the diet did extend their lives. It also enabled hundreds of people—perhaps even thousands—to survive long enough to receive insulin when it became available. Allen left Rockefeller in 1918 to found his own clinic to treat diabetes and other metabolic disorders and to do research. After the discovery of insulin was announced, Allen was among the first physicians to receive samples of the hormone for trials with patients before it was generally distributed, and he made contributions to working out an effective regimen for administering insulin. Allen also received one of the allocations of the Rockefeller Foundation's Insulin Fund in 1923. Frederick M. Allen earned his undergraduate and medical degrees from the University of California, which had its only campus in Berkeley at the turn of the twentieth century. After serving as an intern at the University's affiliated hospital in 1907 and 1908, he worked as a research fellow at Harvard Medical School. In 1913 Allen moved to the Rockefeller Institute. Six years later he left Rockefeller to establish his own center for treating diabetes and other metabolic disorders, the Physiatric Institute, in Morristown, New Jersey, which officially opened in 1921. Allen later did research on high blood pressure and on cancer, and he ended his career at the Pondville Cancer Hospital in Massachusetts.